Well as this story goes....Before the Calgary Sun paper was the Calgary Sun, it was called The Albertan. This desk was from that office! A dad and a son both owned it, life long! The fellow who owned it had it in his garage for years after his dad had owned it for years. The drawers, and other parts! This desk was built with outstanding craftsmanship. Dovetail joints for all the drawers and still just as sturdy as when it was built! Here is the style I saw in my mind for this desk.....Tuxedo!!! I painted the bottom of the desk van Gogh Fossil Paint Chalk White, and the top Mascara Black. Fine, Fine Style for this Tuxedo Desk! 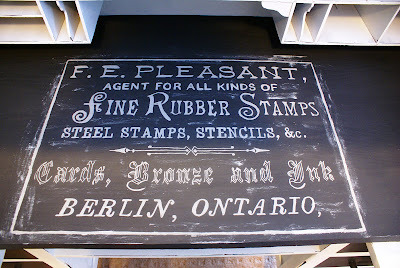 I then added a perfectly matched Vintage Ad for Fine Rubber Stamps and such from Graphics Fairy website. I made the edges a little rough looking as if it was stamped on top of the desk! 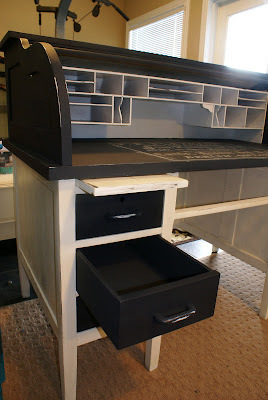 Here is a picture of the drawers, painted as well. I finished it by giving it some worn in Shabby Style and finally 100% all natural Bees-waxed the heck out of it....and I have a bigger right bicep to prove it!! 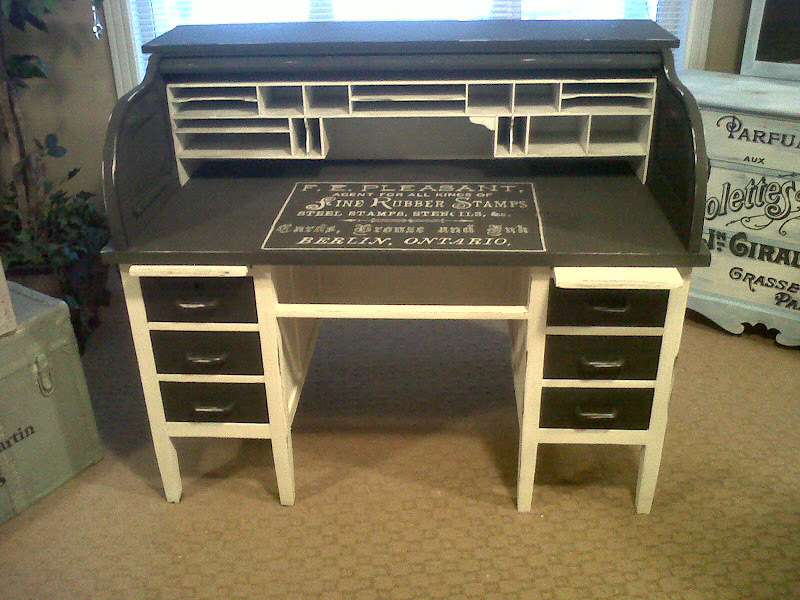 A woman with amazing style bought this desk for her husband for Christmas! 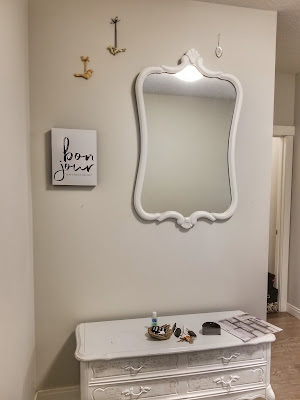 They picked it up this past weekend and are completely in love with it!! Cheers to another 100yrs of life this desk will now have and all the love it will share!